I have a confession to make: until now, I’ve never fully appreciated the Columbia River Gorge. Don’t get me wrong, I’ve always enjoyed hiking at Multnomah Falls and exploring Hood River (especially the breweries), but I never had much interest in the geology of the area. To be quite frank, and possibly uncultured, the sheer amount of basalt bored me. The beauty of the area wasn’t lost on me, but I always dismissed it and found southern and central Oregon to be more “worthy” pursuits. However, as a friend and I drove around the Gorge on Sunday, my attitude changed. The Gorge is what geologists refer to as a Large Igneous Province . The current hypothesis states that during the Miocene, rifts opened in eastern Oregon and Washington, forming basalt floods. At that time they erupted around 170,000 cubic km of lava in 300 flows; 21 of which can be found the Gorge (courtesy of the CVO.) The first of these flows is called the Imnaha flow and started around 17.5 million years ago. It accounts for about 10% of the flows and is only visible in a few locations. The next flow is the Grande Ronde at about 15 million years ago. It makes up about 85% of the basalt flow and is generally visible throughout the Gorge in the lower levels of strata. It was then followed by the Wanapum basalt (~14.5 m.y.) and then the Saddle Mountain basalt (~13.5-6 m.y.) Throughout all this, the lower Columbia River slowly cut its way through the uplifting landscape, starting the formation of the Gorge. This is by no means a comprehensive list of the flows, but it gives a general idea of the amount of basalt that erupted over the course of millions of years. A drive through the Gorge helps to visualize the enormity of the basalt floods. It was this thought that made me reevaluate how I view the Gorge and the geological processes that shaped it. After analysis and controversy, geologists now believe that there were 40 or more separate floods, although the exact source of the water is still being debated. The peak flow of the floods is estimated to be 40 to 60 cubic kilometers per hour (9.5 to 15 cubic miles per hour). The maximum flow speed approached 36 meters/second (130 km/h or 80 mph). Up to 1.9×1019 joules of potential energy were released by each flood (the equivalent of 4500 megatons of TNT). 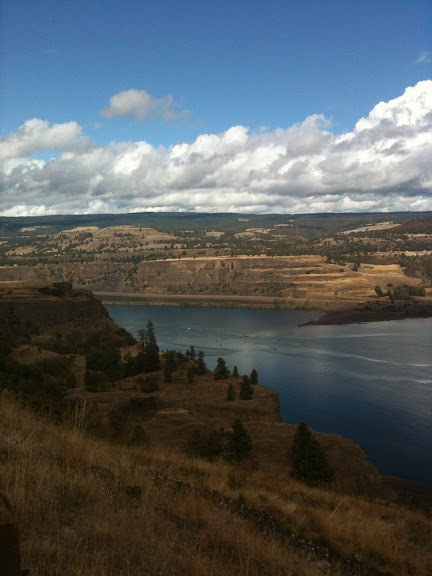 The cumulative effect of the floods was to excavate 210 cubic kilometers (50 cu mi) of loess, sediment and basalt from the channeled scablands of eastern Washington and to transport it downstream. These floods deposited sediment into the Willamette Valley, making it the agricultural powerhouse that it is today. As can be seen from this brief intro, the Columbia River Gorge didn’t have an easy birth. It formed by monstrous basalt flows that were steadily eaten away by the Columbia River and then dramatically purged by the Missoula Floods. This upheaval, while cataclysmic and terrible to witness is what has made for some of the most dramatic scenery in the Pacific Northwest.